HSRL uses a Hamamatsu Nanozoomer S60 high-capacity whole slide scanner, which can scan slides at 20X and 40X magnifications. It has Brightfield and multiplex fluorescence scanning capabilities (up to 6 channels) and can scan single-width (1x3) and double-width (2x3) slides. Morphometric image analysis of whole slide scans is a powerful tool that adds meaningful data to drug development studies. Morphometry can be used to perform linear as well as area measurements, count positive cells and provide quantifications of positive staining of proteins in cells and tissues, among other things. 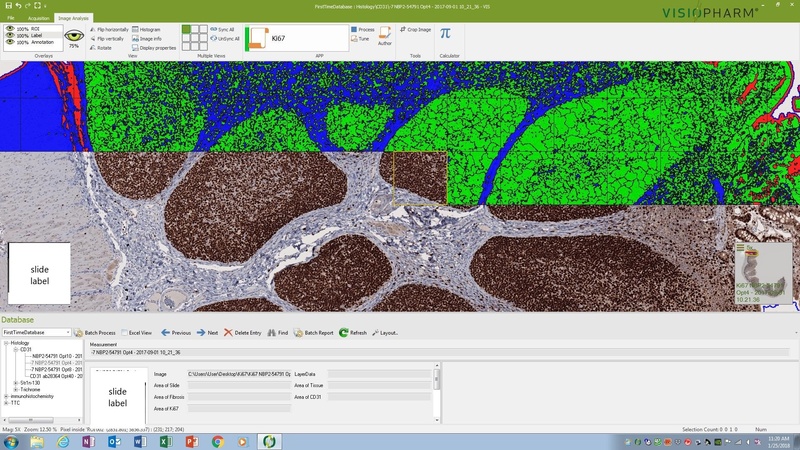 Here at HSRL, we use both the Visiopharm® Biotopix™ and Image-Pro Premier as our image analysis software. Morphometric analysis data can be provided as an excel table or a graph. We can also provide statistical analysis and histopathological interpretation of morphometry data. To request a consult, contact us to start the process. We look forward to hearing from you!